Part of commitment to the Christian life involves prayerful consideration of what you can and will give to the church. This involves time, talent and treasure. Increased support from parishioners allows St. John’s Cathedral to expand the ministries of the church and serve more people in need. If you pledge financially to St. John’s Cathedral, thank you. Your gift is important. If you are a member who has not yet done so, you can pledge online here. Whether you tithe, donating 10 percent of your income, or pledge a different amount, your cathedral community is blessed by your generosity. Thank you! How do I decide how much to pledge to God? In the Bible, Jesus speaks more often about money than he does about prayer. The ability to generate income comes from God, and the first thing that we must do when we receive an income, just as when we receive food, is to give thanks. Giving is a concrete way of thanking God for our blessings and living as Jesus commanded. The Biblical concept of giving is a percentage. As you consider what your annual income will be in the coming year, determine prayerfully what percentage you will give to God. 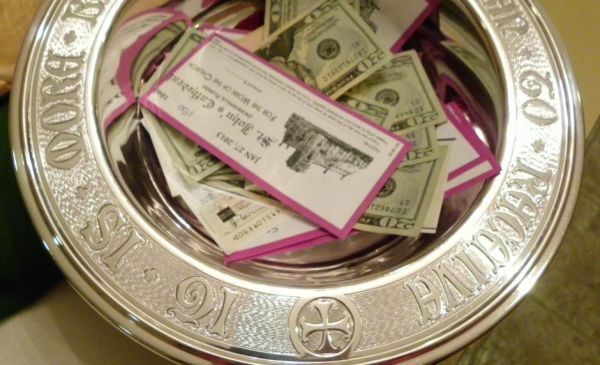 The biblical tithe is 10 percent. If that seems daunting to you, think of a percentage which stretches you and causes you to make a sacrifice to God. You might make a goal of increasing the percent you give over time to work toward the tithe. When I pledge to St. John’s Cathedral, how is my gift used? Our annual budget is based on the success of our pledge drive. Pledged gifts cover clergy and staff salaries, office supplies, communication, facilities maintenance and utilities, our annual 10 percent payment to the Diocese of Florida, youth and parish programs, music, special events and outreach. Outreach accounts for approximately 12 percent of budgeted operating expenses. Our Outreach Council decides what organizations we will support each year. Some of the support we have provided over the years includes support of St. Mary’s Mission Church, the Cathedral School and Early Learning Center, the Cathedral Residences, Family Promise, and the Clara White Mission, to name just a few. What is the annual operating budget of St. John’s Cathedral? This year’s annual operating budget of St. John’s Cathedral is $1,726,568. How much of the budget depends on individual pledges? Pledges cover 67.5 percent of budgeted expenses in fiscal year 2018. Every pledge is important. In 2018, we were able to raise enough in pledges to cover a greater percentage of operating expenses than last year, which was 56 percent. Where does the rest of the money come from? Other operating revenue comes from people who have not pledged, some foundation gifts, and individual bequests and memorials, as well as from “The Saints Fund,” our unrestricted endowment account that has a current balance of $829,842. In 2018, we budgeted to draw $210,191 from The Saints Fund, amounting to 10 percent of the total budget. Many parishes and cathedrals throughout the country rely much more on endowment funds than we do to cover operating expenses. A small amount of additional revenue comes from fees paid by some outside groups to use our facilities, money collected for Wednesday dinners and summer breakfasts, and gifts designated for special projects, speakers and music. What is the Preservation Fund? Is any money from the Preservation Fund used for operating expenses? The Preservation Fund is a restricted endowment established in 1986, intended exclusively for preservation of our historic facility. The current value of the Preservation Fund is $4.13 million. Each year, the Preservation Fund releases up to 5 percent of the ending balance of the fund at December 31 and is used solely for capital improvements to preserve, maintain repair and restore the buildings on the cathedral campus. No money from the Preservation Fund is used to cover any regular operating expenses. Going away for the summer? Don’t forget us! !